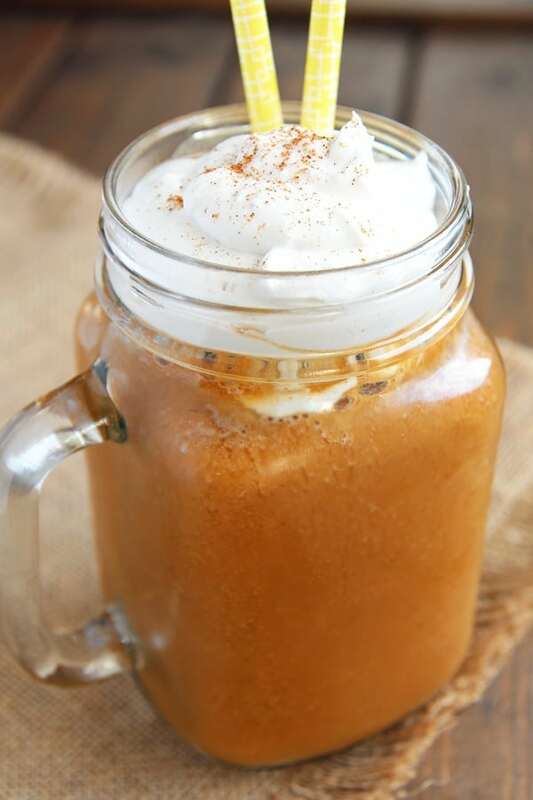 This healthy Pumpkin Spice Frappuccino tastes very similar to Starbucks’ Pumpkin Spice Frappuccino, but it is made from only wholesome ingredients and is naturally sweetened, vegan and gluten-free. It is one of my favorite times of the year again! And of course, Pumpkin Spice Lattes!! I always need to have a celebratory Pumpkin Spice Latte (PSL) when they return to my favorite coffee shop every fall. Well, they were actually back end of August (which is still summer) and we still have some really warm daytime temperatures around here. So when I go for a walk with my baby girl, I actually feel more like a cold drink than a hot one. And thankfully, I can have my PSL as an iced blended version. But to be honest, I really shouldn’t. Going from a really active daytime job to being a WAHM (work at home mom), I am finding my pregnancy pounds clinging on rather stubbornly. So, what’s a girl to do? Of course, I could just skip on my PSL all together, but I had a better idea. I made my own Pumpkin Spice Frappe with only real ingredients, so I might actually call this a wholesome treat. It also is vegan, gluten-free, and refined-sugar free. 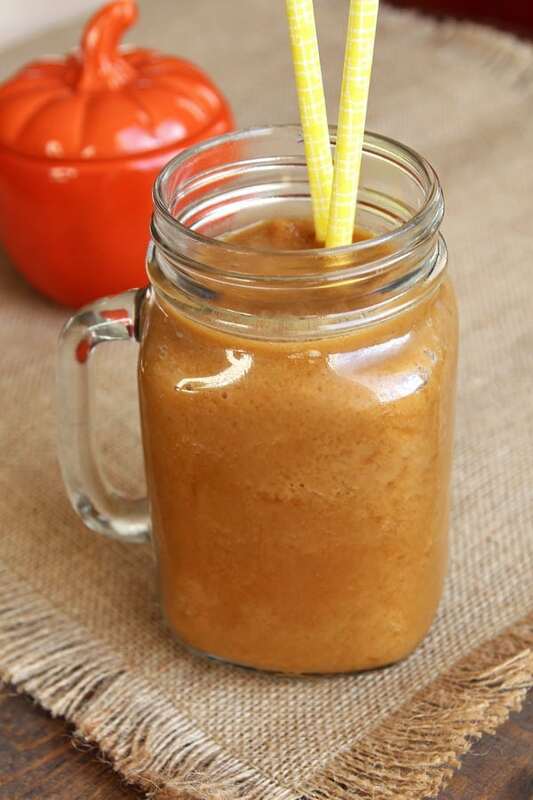 There is pumpkin puree in this frappe, which is first frozen in an ice cube tray. Then we have spices, espresso powder, almond milk and maple syrup as sweetener. This healthy PSL is not quite as sweet as its coffee shop counterpart, but I think that’s a good thing all around (flavor and calorie-wise). If you want to go all the way with a whipped topping (and still stay dairy-free), you can use whipped coconut cream. To make coconut cream, I chill a can of coconut milk overnight and then scoop off and whip the solid part that settles on top of the can. (Unfortunately, this doesn’t seem to work with every kind of coconut milk but I have had good experience with Thai Kitchen brand). What is your favorite thing about fall? Do Pumpkin Spice Lattes make the list? 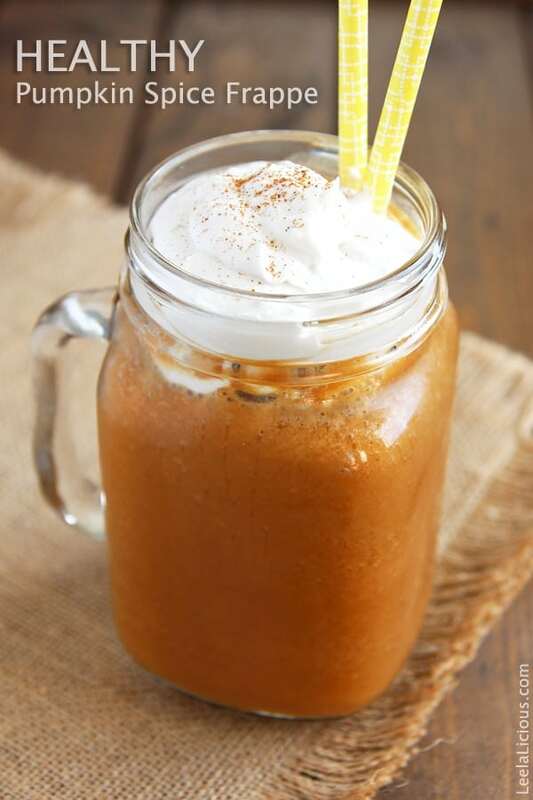 This Pumpkin Spice Frappuccino tastes very similar to Starbucks' drink, but it is made from only wholesome ingredients and is naturally sweetened, vegan and gluten-free. 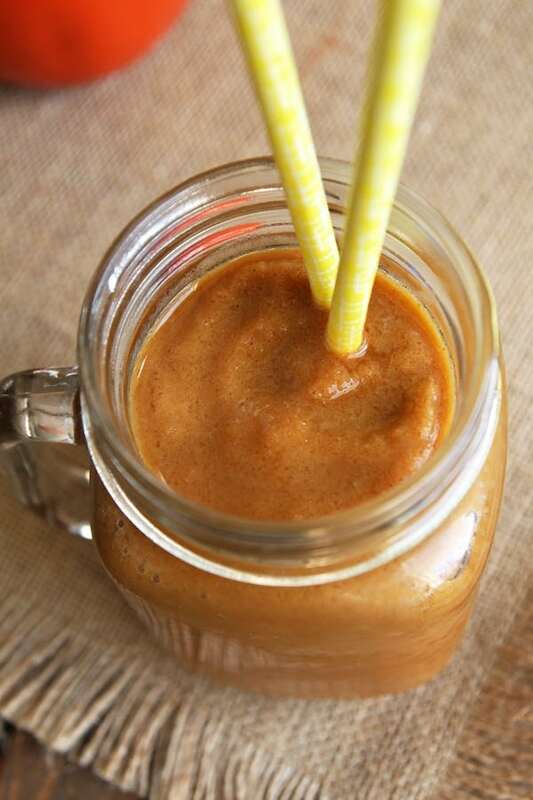 Place all ingredients for the frappe in a blender (liquid first, solids on top) and blend until completely smooth. If desired, top with a few tablespoons of coconut cream and a sprinkle of pumpkin pie spice. 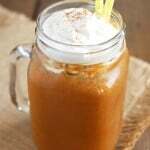 This looks sooo rich and pumpkiny delicious! 🙂 I’ve stopped buying my PSL from you know where… I try not to label things healthy, but homemade just makes more sense – I know exactly what I am adding. Gonna give this bad boy a try! I love that this is made with real, wholesome ingredients! I love PSLs, but I’m trying to drink less of them since there is so much sugar. I’m so behind in blog reading! Belated but very sincere congratulations on the safe arrival of your beautiful Olivia! Your post on her birth was lovely and your pictures were gorgeous. Glad to hear that all is going well. 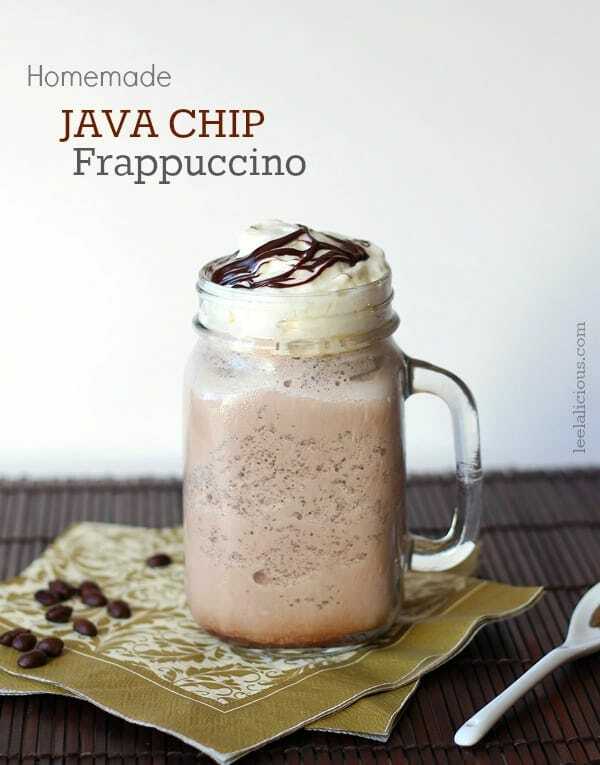 This frappe looks very refreshing and of course, a perfect drink for this time of year. Best wishes to your family. Thank you so much Paula. Olivia has totally changed our lives. It’s not always easy but she has brought us so much joy! Could you make one for me? :-)) This looks sooooooooo tasty!